When Rule #3 arrived in my mailbox I knew that having written often about Escapade it was time I enlisted another AI reviewer for a fresh opinion. But on the very first listen I knew this was the best Escapade release to date, and after a couple more listens was too inspired by the music to not write about it myself. Escapade is, on the one hand, one of the more interesting bands on the current space rock scene. Yet their music draws on several genres and styles, defying easy categorization. Space rock, Krautrock, psychedelia, trance, progressive, free-improv... Escapade recalls the glory days of freeform Kosmiche music while simultaneously pushing the envelope to create music that is always electrifying and fresh. 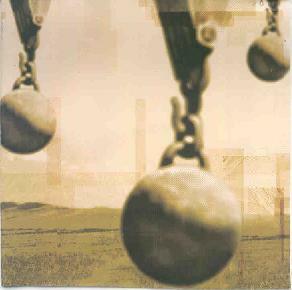 The album opens with "A Symphony Of Sirens". The band builds a dark and dense wall of drone that is both trancey and acidic. The guitars wail, the synths bubble and pulsate high pitched tones and swirling patterns, and the thudding trance bass leads the ensemble down a hypnotic path. Old time Krautrock is dragged into the modern era as the band embellishes the music with a parade of cosmic sounds and trance atmospherics. A powerful jam that explores freely but never meanders. Though completely improvised, the music at all times sounds determined and confident of its path. "Mysterious Utterances" consists of space ambience and drones with heavy looping and/or backwards effects to give it a surreal freaky feel. Circumference" is a thudding, spacey, somewhat metallic rocker. The guitars thrash about backed by a steady pounding rhythm section and pulsating effects. Tension builds steadily in trademark Escapade fashion as the volume slowly cranks up and an anxious feeling creeps in. The synth pulsations settle into a mechanical groove and the guitars start to trip out like something from an early Amon Düül II album, but also has a touch of King Crimson. "Eclipse In Carbon" is a high volume roller coaster ride of smashing bass, deadly drones, freakout guitars, and UFO synths that swirl out of control, giving the feeling that I was caught up in the funnel of a tornado. "And Then All Silence Was Crushed" is one of my favorites. A steady and highly intense foundation slowly builds, resulting in something along the lines of King Crimson gone acid Kosmiche. The guitars have a Frippoid sound, the drumming is everywhere at once, a marimba provides an embellishment to the percussion, and the synths are like lasers blasting. The music evolves steadily, never radically straying from it's principle theme, but the musicians continually head off into subtly varying directions to keep things interesting, and the intensity level is so high that I was jamming along with the band throughout. Finally, in a first for Escapade, this all-improv band does a cover of Pink Floyd's "Interstellar Overdrive". The band opens and closes with the song's classic riff but in between takes the music deep into Escapade territory and makes the song their very own. TOTALLY cosmic, alternating between being freaky-ambient and kicking out a noisy avant acid rock edge. In summary, this is my hands down favorite Escapade release to date. A killer blend of jamming spaced out Krautrock, trance, and drone, the band occupies an undefinable space between the sounds we all love from yesteryear and a more forward thinking post-rock sound. HIGHEST recommendation. For more information you can visit the Submergence web site at: http://motherwest.com/submergence/. Submergence is a division of Mother West. Contact via snail mail c/o Mother West LLC; 132 W. 26th Street; New York, NY 10001.